Just Write About It. : Brit's Abroad: Washington DC, Obama, and "Oh look! it's The Monument!" 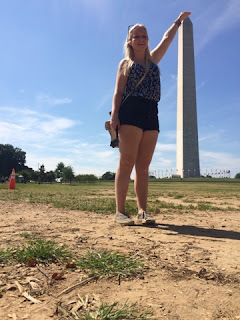 Brit's Abroad: Washington DC, Obama, and "Oh look! it's The Monument!" We were staying at The Beacon Hotel, complimentary with valet service and a roof top bar just next door, we could not have had it better. First things first as we wake up in the heart of Washington D.C. to The White House! After a short walk, we arrived to the small crowd of fellow tourists all attempting to take the best photograph they could through the disappointing iron railings which disrupt your view of the world famous building. This attraction seems to encourage a lot of American visitors, too who aren't local Washington folk. You can sometimes forget how vast America really is and underestimate how few citizens have managed to make there way around the entirety of it. I overheard a tourist state "thought it'd be bigger, whiter and taller". But never-the-less I was impressed by the view. 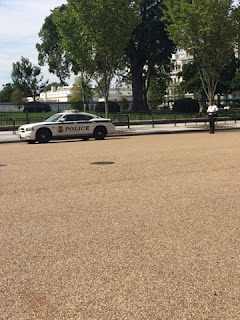 After taking a few selfies and taking in the full scope, we were sharply escorted onto the "sidewalk" by the secret service (who were not-so-secret and had "secret service" printed all over their vehicles and uniforms). We were made to move off of the road outside which at the time, we had no idea why. We also spotted multiple armed men appear on the roof of The White House. The scene began to look like it was picked straight out of the film "White House Down" (which we later went back to the hotel and watched just so that we could point at the screen and say "I've been there!". It wasn't until we became impatient of waiting for something to happen and began to walk away from the landmark that we noticed a helicopter preparing to land on the premises surrounding the house. It was Obama and Michelle! We were convinced... I mean, who else could it have been? 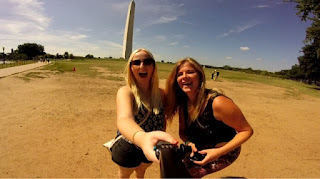 Washington D.C. is jam packed with things to visit and see, it really is tourist heaven! 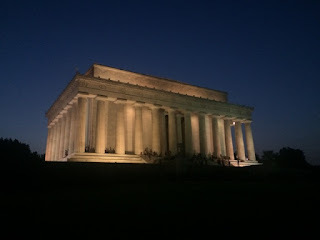 And so the next place on our list was to visit THE monument. Now, this monument is EVERYWHERE. It's always coming up on you left whenever you're driving around D.C. and still i'm not entirely sure what it is there to symbolize or represent. There isn't any plaques or information boards surrounding the monument itself. But it is an overwhelming height. The size of it is so much to take in! 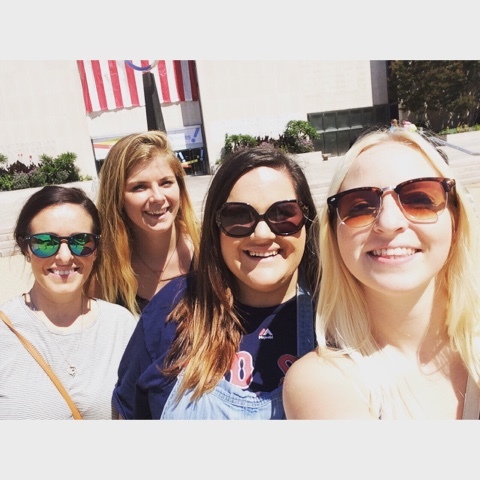 And we of course had to do the typical "Leaning Tower of Pisa selfie" once we had arrived. Up next on our list was going to be to visit a few of the museums which D.C. has to offer. There is extremely tight security as we entered The American National History Museum which felt extremely hostile. Although once we were able to entire the museum we were hit with the juxtaposition of a jazzy American Royal Air Force musical band who were singing patriotic songs. Cheesy but also extremely welcoming. It's also rather humbling that there is so much American pride. Especially when you're from Britain where there is very little patriotism in practice at all. It's nice to see, I think we should be more proud of where we come from, too. It was rather uncomfortable at times as a Briton walking around the National History Museum where it seemed to blame Britain for pretty much everything. There was even an indirect quotation which stated in the Holocaust Museum that Hitler's up-rise was allowed to take place due to England and other surrounding countries just standing by. It wasn't very pleasant I must admit. 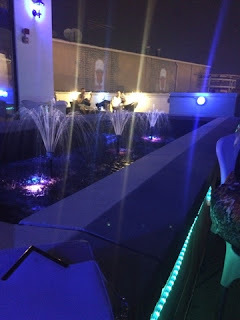 After a few cocktails on the rooftop of a bar, we of course ended up on a night out. The clubs were very strange, They even remixed Oasis, but what the hell! We were paying $1 for terrible beer and everyone was so intrigued by our accents, most didn't even believe they were real. It's safe to say we had a bloody fabulous night. The next day after peeling ourselves out of bed, we went out for breakfast and agreed that we would wait until sunset until we were going to drive around all of the monuments. We may have got lost on the way and accidentally ended up in restricted area for authorised vehicles only on the Pentagon grounds... But anyway, back on the road! So first we headed to Abraham Lincoln and then walked over to the Martin Luther King memorial. The views were phenomenal at this time of evening. Washington D.C. was one of my favourite places to visit during my travels across North America. It was really hip and cosmopolitan, and so much more welcoming than the likes of New York City. Littered with Irish pubs and bars, Moroccan magicians blowing my mind (once under the influence) and separate menus for dogs in Shake Shack, D.C. is definitely on my 'places I need to return to' list. Have you been to Washington D.C. too? Let me know what you thought in the comments below!